2. Even when I try to burn less than 700 to it by pressing the continue button it simply does nothing! Easy Media Creator 9 Suite was the full retail version around 2006. Thanks for your reply to my post. Yes, when I looked in windows (xp) it shows the disk as blank and calls it 'CD Drive'. I tried the disk on my work PC (laptop with windows 8) and it looked fine there. Is this a problem with Windows XP? Which freecom burner did you buy? . Are you sure it is a DVD R or RW? 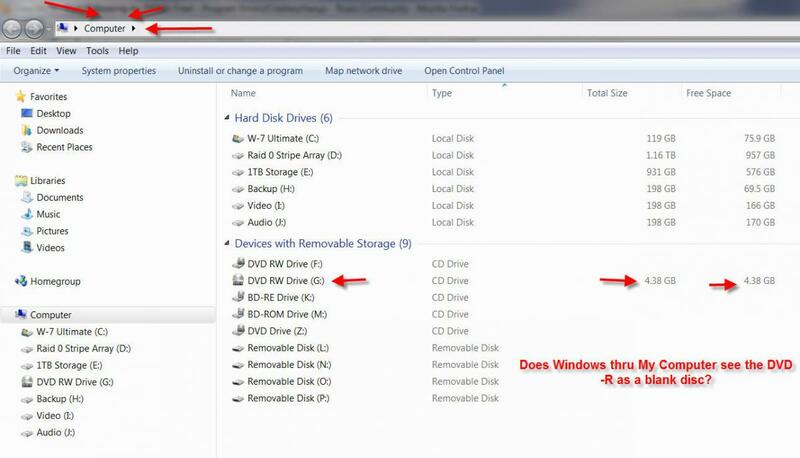 Go to Windows Device manger and copy and past the text you find for the optical drive. I am assuming that you selected the correct type of disc in the progam. I don't have that version but it is usually at the bottom left of the program window. Hi - SOrry for not gettnig back to you sooner. There is no facility to select the type of Disk that i can see in EMC9 - I just selected the drive (drive K) which is this Freecom Drive. What next - update driver? Being able to burn a cd or a DVD is very different. So success with a cd has nothing to do with burning a non-copy writed DVD (DRM protection). Why did you install Windows drivers/firmware. Did you have a disc with the burner? Go here to see if you have the correct firmware. (Good luck, I tried 3 different browsers and could not get to the firmware). What application are you using to burn the DVD? There should be a little windows at the bottom left of the screen to select the size of the disc. My pic shows my system calling the drive a CD Drive also, no big deal. I don't understand the bold text answer above? Windows 8 retail isn't released to the public yet, what Windows 8 is on your work PC? How is it fine on W-8 PC compared to XP PC? Would seem to be an issue with the freecom drive but it should work with DVD- r as it says on the back of it. If your Freecom writer isn't working properly with DVDs on any of your computers, [your own one or your work computer with Windows 7 and the yet-to-be-released Windows 8,] then this is obviously NOT a fault with Easy Media Creator 9. You need to test the hardware thoroughly. If it's working properly with CDs but not DVDs, please be aware that writers use separate physical systems for CDs vs. DVDs and it is possible for the DVD system to have failed while the CD system keeps working happily. I'm not saying that's what has happened, but you need to keep the possibility in mind.